We are not using a single threshold breach condition based on acceleration, which is typical in the telematics aftermarket. To measure force we need acceleration from the device and the vehicle dynamics, which we get from the VIN. a.System level reliability – comprises the entire machine to machine stack involved in capturing, discriminating, characterizing, transporting and rendering the crash report. 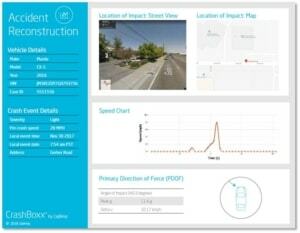 Automate the accident notification process, either as a stand-alone service or as part of a comprehensive vehicle management program that provides added value to the vehicle owner and the driver. 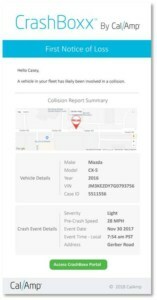 Automate incident reporting, capture comprehensive crash data and facilitate validation and investigation to streamline the claims process. Certified for automatic crash reporting performance and reliability.